Can't use 64bit wavpack in windows 10. I'm using the latest official wavpack 2.75.2 on windows 10 pro x64(alse the latest official build). But sseems that 64bit version doesn't work. 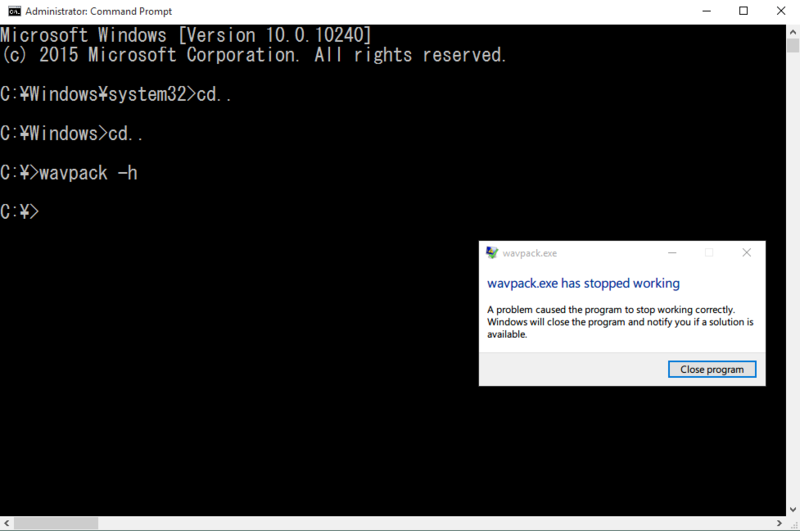 Even use the command wavpack.exe -h . →Get the error message wavpack.exe has stopped working. Sorry about that I can't check on other windows version. Anyone use win10 with the 64bit version wavpack fine? Working fine for me on W10 x64. Who are you and how did you get in here ? I'm a locksmith, I'm a locksmith. I've reproduced the same problem on other windows 10 pc. Possibly the compile you are using requires an unsupported CPU feature. And the compile I'm using is downloaded from the Official Web Site. Unfortunately I don't have a Windows 10 system yet, but maybe you can answer a couple questions. First, does “wavpack --help” work, or does it only crash if you try to compress audio? Also, can you check if the previous version crashes too (it's been out for almost 5 months)? It's located here. In the meantime, of course, you can use the 32-bit version. It's actually almost as fast as the 64-bit version, and sometimes even faster. Thanks for the help, and sorry for the trouble! and same with the previous version. No problem running it here on Win 10 Pro x64 (upgraded from Win 7). I also checked with depends, and I see that it only depends on kernel32.dll, so I discard runtime dependency problems. This is on an old core 2 duo, so it also discards requing sse4 or something. What's the full path (incl. filename) of the encoder? * run Command Prompt as Administrator . *put wavpack to D and run Command Prompt as Administrator. Corrupted download or broken windows install? There's only one tricky thing that wavpack.exe does before displaying the help message, and I've eliminated that for a test (it has to do with the debug mode). Could you please try the attached executable with either just "wavpack" or "wavpack --help"? with the test version "wavpack" and "wavpack --help" both crashed,too. I'm using a clean install of the official ISO. And Another Win 10 PC occured this too. I'm not using the English version windows, so maybe the language Compatibility problem? I built Wavpack 4.75.2 with 3 different compilers. Maybe one of them will work? There is one thing that bugs me on that screenshot, that "Y"-like symbol. Is that a chinese/japanese Windows? If so, maybe the problem is related to unicode support. (in the multibyte sense of the term). Btw, to further help on the diagnosis, it would be nice that you report the real error. To do so, open the Event viewer (you can do that easily writing eventvwr on the search box). Notice that in the CP932.TXT mapping table linked below, code 0x5C is mapped to U+005C REVERSE SOLIDUS (\). This is often a source of confusion because in many Japanese fonts, this code is displayed as a Yen symbol, which would normally be represented as U+00A5 YEN SIGN (¥) in Unicode. However, on Windows systems, code 0x5C in code page 932 behaves as a reverse solidus (backslash) in all respects other than how it is displayed by some fonts. Here is the real error. msvc2010 and msvc2013 both crashed. But the gcc version works! 2) start VMMap, choose wavpack.exe process, then File -> Save As... and save wavpack.mmp file. 3) Open Event viewer, and find the event for this crash. 4) post the contents of the event and wavpack.mmp. Error code 0xc0000005 means access to an invalid address. Usual for uninitialized pointer variables, or for retreiveing something that is usually obtained without problems, but that this time failed and is not checked against this fact when used afterwards. (Guess it's more like the later than the former). Still a shot in the dark, but it could have been other error codes. It says "Enter decryption key"